So you’ve got the bolt-ons, you’ve got the tune, but it still just isn’t enough, right? Don’t let this keep you up at night, because your desires can now be completely fulfilled. CP-e we know that you don’t want to go faster, but instead you need to go faster. That need is why countless hours in R&D have been spent to develop the last turbo kit that you will ever need to look at for your Mazda MPS 3. Introducing Atmosphere, the new MazdaSPEED3 Turbo Kit by CP-e. The ultimate big turbo upgrade for your Mazda MPS 3 application includes everything you need to take care of your need for speed and to take your car from a stock turbo to a new Tial Stainless Steel Big Turbo. A common setup for the turbo bypass is to use a screamer pipe, which dumps the exhaust to the atmosphere immediately after the exhaust manifold. This practice is lackadaisical at best, so CP-e has taken the extra time and effort to divert the exhaust correctly. The CP-e DownScream diverts gases straight into the exhaust pipes to be expelled out of the rear of the car. Having this setup keeps your high boost events quietly intense, rather than noisy and agonizing. CP-e has designed this downpipe to keep your system within a legitimate decibel range. The shining piece to this kit is by far the CP-e Mazda MPS 3 DownScream. Made with 3” 304 stainless steel, this downpipe eliminates both stock catalytic converters to allow for smooth exhaust flow and transition. 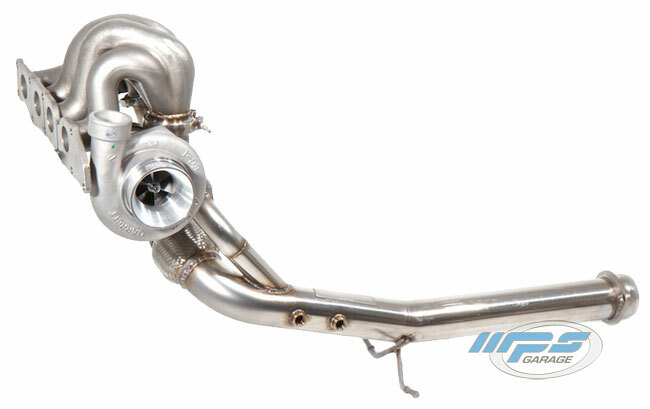 Not only is this downpipe designed to give a free flowing exhaust from your turbo, but it is also designed to attach to the Tial MVR External Wastegate. The wastegate actuates at high pressure and causes the system to divert the engine exhaust away from the turbo. This kit is available in both GT & GTX Turbos. Jump straight to the pages here!